These Ornate Picture Frames Are Designed to Accomodate A 4" x 6" Prints. Each Frame Features An Easel Backing for Displaying Portrait or Landscape Style Image. Get This 4" x 6" Ornate Picture Frames from This Website to Received More Savings! Holds portrait or landscape 4" x 6" style prints. Glass overlay included to protect the image from getting damaged. 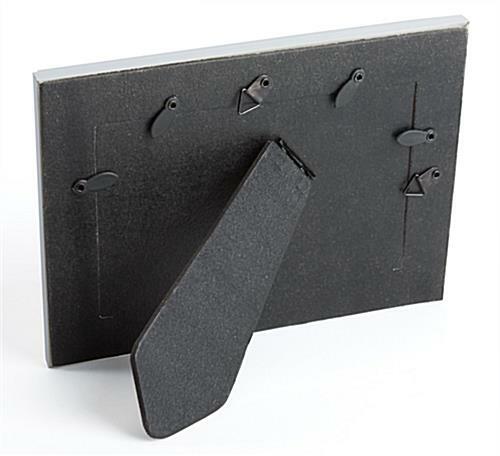 Wall-mounting hooks included at the back of the frame for easy wall-mount display. Frame constructed from polystyrene with decorative white profile for affordability. 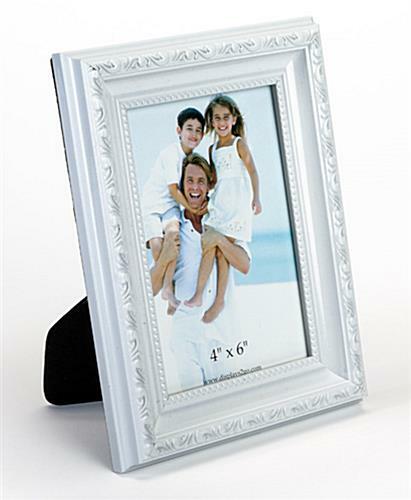 These image displays, white ornate picture frames make a perfect photo holder at home or any business environment. Each unit is designed to hold a 4" x 6" portrait or landscape style image. Instead of keeping all the beautiful pictures in an album or a box, why not display them in these ornate picture frames. The image display is ideal for displaying photos, awards, artworks, crafts or advertisements. These ornate picture frames that have a decorative profile give the display an antique and classic look. The elegant design of the displayer makes the unit great for use in any environment. These countertop displays, ornate picture frames are constructed from polystyrene. The plastic fabrication of the display also makes the unit less expensive compare to wood or metal made framing. Even though these 4" x 6" ornate picture frames are made from plastic, the photo holder looks like a replicate wooden holder from a distance away. These ornate picture frames that have an antique style can be used as a wall-mount or countertop displayer. Users can displayed the photos vertically or horizontally on the table. These ornate picture frames, such as image holders and photo displays are sold with a glass overlay included. The glass panel is provided to protect the prints from dust and fingerprints. These ornate picture frames that have an easel backing can also be hung on the wall in both orientations by using the wall hooks at the back. The image holders are sold in other sizes and colors as well. Photo displays are sold at a fraction of the cost of wood or metal framing, yet have the same authentic look. So why pay more when customers can get these image holders that looks like wood at a lower price? Buy these photo displays now! 32.0" x 8.0" x 1.0"
WARNING: This product can expose you to Styrene, which is known to the State of California to cause Cancer. For more information go to www.p65warnings.ca.gov.